Timber lining boards from Glosswood are versatile in application and also recommended for use in hospitality fitouts. Glosswood is ideal for creating feature walls or ceilings in cafes and restaurants. 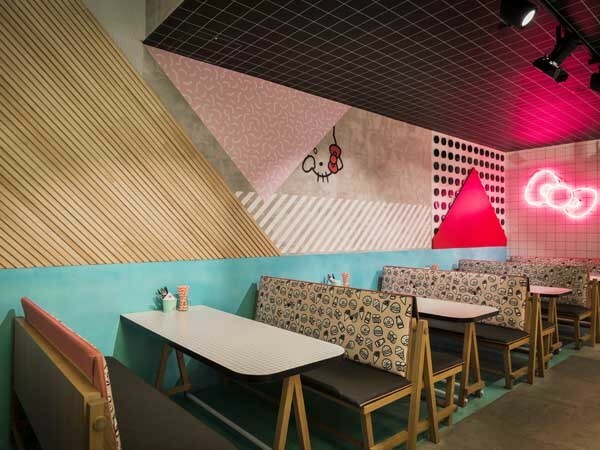 Glosswood timber lining boards were used to create a striking feature wall at the Hello Kitty diner in Sydney. Why choose Glosswood for your cafe interiors? Glosswood uses Paulownia timber, a lightweight hardwood timber that is sustainably grown and harvested, making it a more environment-friendly option than native timber species. The lightweight nature of Paulownia timber simplifies and speeds up installation. The tongue & groove system of Glosswood’s timber lining boards makes installation easy and quick for the installer. Glosswood’s timber lining boards are being specified for commercial projects across Australia because of their aesthetic appeal. The boards are available in a vast range of natural and designer colours, as well as different profiles. Design team Luchetti Krelle installed Glosswood’s timber lining boards on the feature wall of the 1950s style diner to create an interior that drew passing pedestrians into the cafe.